This article is about the philosopher. For the book, see Mencius (book). Mencius, also known by his birth name Meng Ke (孟軻), was born in the State of Zou, now forming the territory of the county-level city of Zoucheng (originally Zouxian), Shandong Province, only thirty kilometres (eighteen miles) south of Qufu, Confucius's birthplace. He was an itinerant Chinese philosopher and sage, and one of the principal interpreters of Confucianism. Supposedly, he was a pupil of Confucius's grandson, Zisi. Like Confucius, according to legend, he travelled throughout China for forty years to offer advice to rulers for reform. During the Warring States period (403–221 BC), Mencius served as an official and scholar at the Jixia Academy in the State of Qi (1046 BC to 221 BC) from 319 to 312 BC. He expressed his filial devotion when he took three years leave of absence from his official duties for Qi to mourn his mother's death. Disappointed at his failure to effect changes in his contemporary world, he retired from public life. Mencius is buried in the "Mencius Cemetery" (孟子林, Mengzi Lin, also known as 亞聖林, Yasheng Lin), which is located 12 km to the northeast of Zoucheng's central urban area. A stele carried by a giant stone tortoise and crowned with dragons stands in front of his grave. Mencius's mother is often held up as an exemplary female figure in Chinese culture. One of the most famous traditional Chinese four-character idioms is 孟母三遷 (pinyin: mèngmǔ-sānqiān; literally: 'Mencius's mother moves three times'); this saying refers to the legend that Mencius's mother moved houses three times before finding a location that she felt was suitable for the child's upbringing. As an expression, the idiom refers to the importance of finding the proper environment for raising children. She is one of 125 women of which biographies have been included in the Lienü zhuan ('Biographies of Exemplary Women'), written by Liu Xiang. Duke Huan of Lu's son through Qingfu (慶父) was the ancestor of Mencius. He was descended from Duke Yang of the State of Lu (魯煬公). Duke Yang was the son of Bo Qin, who was the son of the Duke of Zhou of the Zhou dynasty royal family. The genealogy is found in the Mencius family tree (孟子世家大宗世系). During the Ming dynasty, one of Mencius's descendants was given a hereditary title at the Hanlin Academy by the Emperor. The title they held was Wujing Boshi (五經博士; 五經博士; Wǔjīng Bóshì). In 1452 Wujing Boshi was bestowed upon the offspring of Mengzi-Meng Xiwen (孟希文) 56th generation and Yan Hui-Yan Xihui (顔希惠) 59th generation, the same was bestowed on the offspring of Zhou Dunyi-Zhou Mian (週冕) 12th generation, the two Cheng brothers (Cheng Hao and Cheng Yi-Chen Keren (程克仁) 17th generation), Zhu Xi-Zhu Ting (朱梴) 9th generation, in 1456–1457, in 1539 the same was awarded to Zeng Can's offspring-Zeng Zhicui (曾質粹) 60th generation, in 1622 the offspring of Zhang Zai received the title and in 1630 the offspring of Shao Yong. One of Mencius's direct descendants was Dr. Meng Chih (Anglicised as Dr. Paul Chih Meng) former director of China House, and director of the China Institute in 1944. Time magazine reported Dr. Meng's age that year as 44. Dr. Meng died in Arizona in 1990 at the age of 90. North Carolina's Davidson College and Columbia University were his alma mater. He was attending a speech along with Confucius descendant H. H. Kung. In the Republic of China there is an office called the "Sacrificial Official to Mencius" which is held by a descendant of Mencius, like the post of "Sacrificial Official to Zengzi" for a descendant of Zengzi, "Sacrificial Official to Yan Hui" for a descendant of Yan Hui, and the post of "Sacrificial Official to Confucius, held by a descendant of Confucius. The descendants of Mencius still use generation poems for their names given to them by the Ming and Qing Emperors along with the descendants of the other Four Sages (四氏): Confucius, Zengzi, and Yan Hui. One of Mencius's descendants moved to Korea and founded the Sinchang Maeng clan. While Confucius himself did not explicitly focus on the subject of human nature, Mencius asserted the innate goodness of the individual, believing that it was society's influence – its lack of a positive cultivating influence – that caused bad moral character. "He who exerts his mind to the utmost knows his nature" and "the way of learning is none other than finding the lost mind." According to Mencius, education must awaken the innate abilities of the human mind. He denounced memorization and advocated active interrogation of the text, saying, "One who believes all of a book would be better off without books" (盡信書，則不如無書, from 孟子.盡心下). One should check for internal consistency by comparing sections and debate the probability of factual accounts by comparing them with experience. Mencius emphasized the significance of the common citizens in the state. While Confucianism generally regards rulers highly, he argued that it is acceptable for the subjects to overthrow or even kill a ruler who ignores the people's needs and rules harshly. This is because a ruler who does not rule justly is no longer a true ruler. 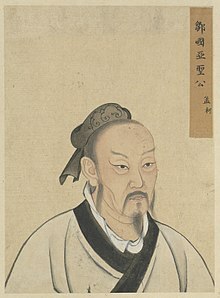 Speaking of the overthrow of the wicked King Zhou of Shang, Mencius said, "I have merely heard of killing a villain Zhou, but I have not heard of murdering [him as] the ruler." Mencius distinguished between superior men who recognize and follow the virtues of righteousness and benevolence and inferior men who do not. He suggested that superior men considered only righteousness, not benefits. That assumes "permanent property" to uphold common morality. To secure benefits for the disadvantaged and the aged, he advocated free trade, low tax rates, and a more equal sharing of the tax burden. His alleged years make him contemporary with Xun Zi, Zhuangzi, Gaozi, and Plato. Xun Zi was a Confucian who believed that human nature is centered on self-interest and greed, and the purpose of moral cultivation is to develop our nature into goodness. This put him at odds with Mencius. Later, the thinker Zhu Xi declared the views of Xun Zi to be unorthodox, instead supporting the position of Mencius. Mencius's interpretation of Confucianism has generally been considered the orthodox version by subsequent Chinese philosophers, especially by the Neo-Confucians of the Song dynasty. Mencius's disciples included a large number of feudal lords, and he is said to have been more influential than Confucius had been. The Mencius (also spelled Mengzi or Meng-tzu), a book of his conversations with kings of the time, is one of the Four Books that Zhu Xi grouped as the core of orthodox Neo-Confucian thought. In contrast to the sayings of Confucius, which are short and self-contained, the Mencius consists of long dialogues, including arguments, with extensive prose. It was generally neglected by the Jesuit missionaries who first translated the Confucian canon into Latin and other European languages, as they felt that the Neo-Confucian school largely consisted of Buddhist and Taoist contamination of Confucianism. Matteo Ricci also particularly disliked Mencius's strong condemnation of celibacy as unfilial. François Noël, who felt that Zhu's ideas represented a natural and native development of Confucius's thought, was the first to publish a full edition of the Mencius at Prague in 1711;[d] as the Chinese rites controversy had been recently decided against the Jesuits, however, his edition attained little influence outside central and eastern Europe. ^ The original clan name was Mengsun (孟孫), later shortened into Meng (孟). It is unknown whether this occurred before or after Mencius's death. ^ , meaning second only to Confucius. The name was given in 1530 by the Jiajing Emperor. In the two centuries before 1530, the posthumous name was "The Second Sage Duke of Zou" (鄒國亞聖公) which is still the name that can be seen carved in the Mencius ancestral temple in Zoucheng. ^ "Mencius". Random House Webster's Unabridged Dictionary. ^ Jaroslav Průšek and Zbigniew Słupski, eds., Dictionary of Oriental Literatures: East Asia (Charles Tuttle, 1978): 115-116. ^ "Present day political organization of China". archive.org. ^ "Kanripo 漢籍リポジトリ : KR2m0014 欽定續文獻通考-清-嵇璜". kanripo.org. ^ Sturgeon, Donald. "欽定歷代職官表 : 卷六十六 - 中國哲學書電子化計劃". ctext.org. ^ Wilson, Thomas A.. 1996. “The Ritual Formation of Confucian Orthodoxy and the Descendants of the Sage”. The Journal of Asian Studies 55 (3). [Cambridge University Press, Association for Asian Studies]: 559–84. doi:10.2307/2646446. JSTOR 2646446 p. 571. ^ "Paul Chih Meng, 90, Headed China Institute". The New York Times. 7 February 1990. ^ "Education: China House". TIME. Sep 4, 1944. Retrieved May 22, 2011. ^ Yagi, Kiichiro (2008). "China, economics in," The New Palgrave Dictionary of Economics, v. 1, p. 778. Abstract. ^ Hart, Michael H. (1978), The 100: A Ranking of the Most Influential Persons in History, p. 480. ^ Hart, Michael H. (1978), The 100: A Ranking of the Most Influential Persons in History, p. 7, discussed on pp. 479–81. Ivanhoe, Philip J., 2002, Ethics in the Confucian Tradition: The Thought of Mencius and Wang Yangming, 2nd edition, Indianapolis: Hackett Publishing. Liščák, Vladimir (2015), "François Noël and His Latin Translations of Confucian Classical Books Published in Prague in 1711", Anthropologia Integra, Vol. 6, No. 2, pp. 45–52 . Van Norden, Bryan W. (trans. ), 2008, Mengzi: With Selections from Traditional Commentaries, Indianapolis: Hackett Publishing. Wikisource has the text of the 1921 Collier's Encyclopedia article Mencius.